** This DVD is no longer available online. Contact the film's owner for an available copy. See behind the scenes, cast and crew interviews and how this year & a half long project was created. 12 Deleted Scenes, originally slated for the film, shot but cut in the final version revealing new characters. Outtakes and fun on the set. Join Director John Wattenbarger, Dir of Photography and star Jeffrey Bader and Writer Bill Morse for commentary while you watch the movie. Hear more of this exciting process and inside movie tidbits. 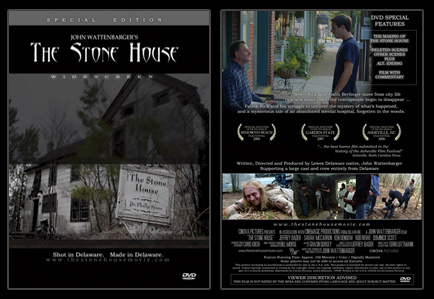 Watch the originally written and filmed ending of The Stone House, drastically different than its theater release!